Slow Cooker Ranch Pork Chops is the ultimate EASY recipe – just a few minutes of prep & you’re on your way to a tasty dinner the entire family will love. Are you looking for a quick and easy dinner recipe to add to your lineup? Then look no further. 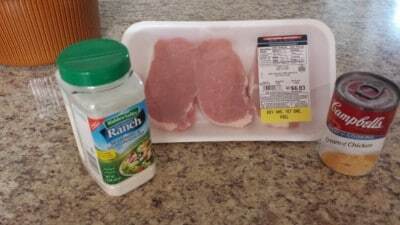 Slow Cooker Ranch Pork Chops is both quick to assemble (just 3 ingredients!) and easy (toss everything in the slow cooker and forget about it for a few hours). 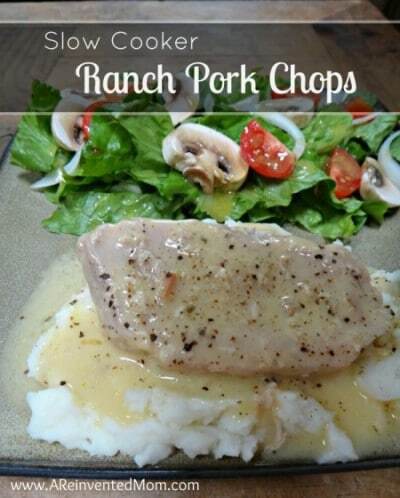 I hesitated to post the recipe for Slow Cooker Ranch Pork Chops because it is soooo easy. But then, quick and tasty recipes are the ones I cook most often. And, this recipe screams “comfort food” to me. If that isn’t enough to tempt you, the pork chops are melt-in-your mouth tender and taste amazing. You’ve gotta make this for your family! Pork chops – I prefer to use boneless, but you can use boned chops. I’d increase the meat by half a pound to compensate for the bones. Ranch dressing mix – everything is better with ranch. Friends, this couldn’t be any easier. Place the pork chops in the slow cooker. Combine the soup with the dressing mix and pour over the pork chops. 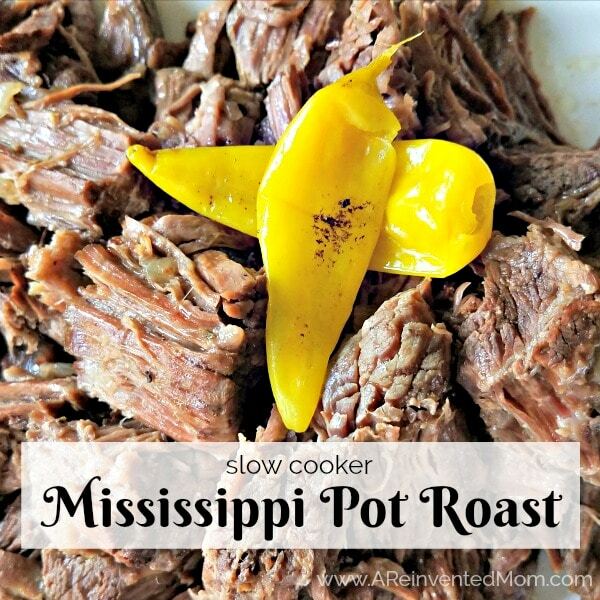 Cover the crockpot and let it hand out and do it’s thing for a few hours. 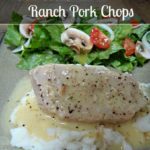 I typically serve Slow Cooker Ranch Pork Chops over mashed potatoes. If you have potato-haters in your house (ahem), serve over rice. Add a side salad of greens and warm bread for a delicious meal your entire family will love. If that isn’t enough to tempt you, the pork chops are melt-in-your mouth tender and taste amazing. 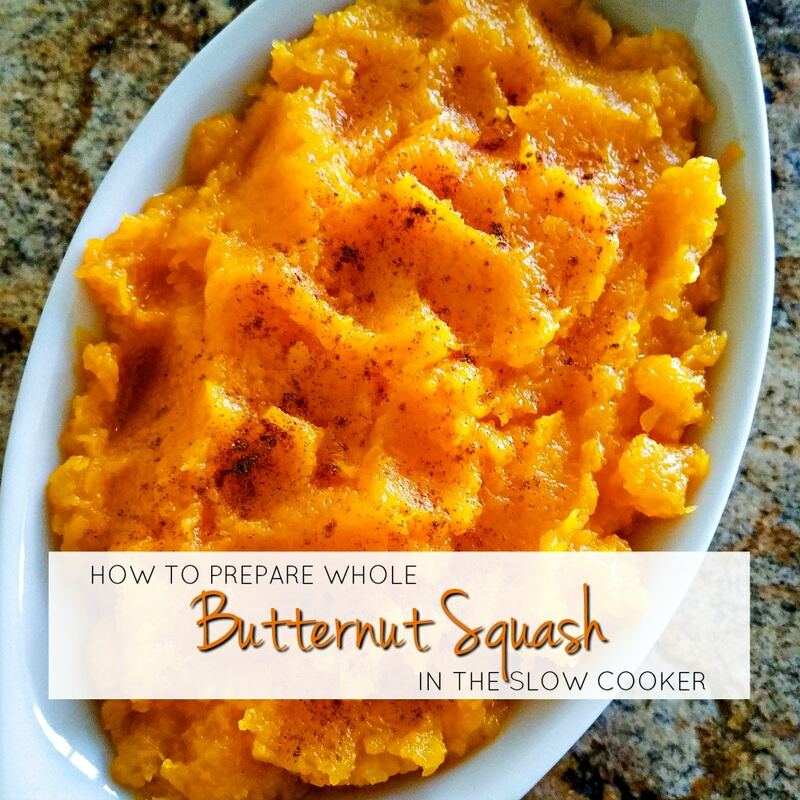 I’ve linked this recipe at: Full Plate Thursday, Meal Plan Monday and Weekend Potluck. A Reinvented Mom is a participant in the Amazon Services LLC Associates Program, an affiliate advertising program designed to provide a means for sites to earn advertising fees by advertising and linking to Amazon.com. This post may contain an affiliate link(s). If you choose to click on the link and/or make a purchase, I may be paid a small amount which helps to support this website. All opinions are my own. 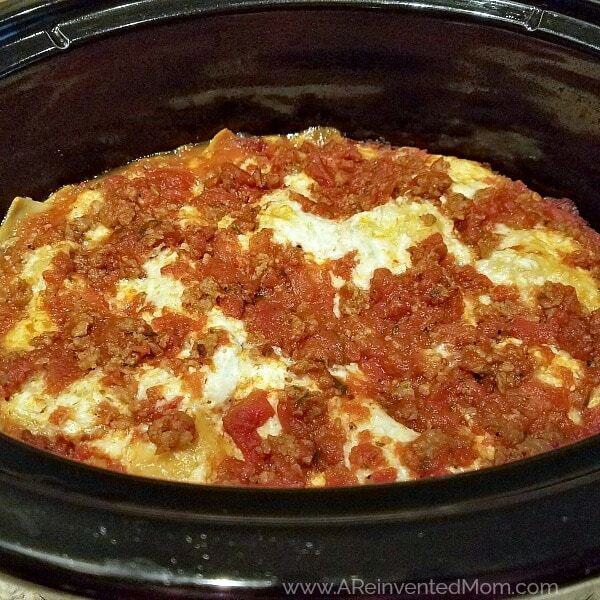 An easy "set & forget" slow cooker recipe for busy days. Spray the slow cooker liner with non-stick spray or use a slow cooker liner for easiest cleanup. Blend the cream of chicken soup and ranch seasoning mix in a small bowl. Pour over pork chops. Cook on High for 3-4 hours or Low for 6 hours. If sauce is too thick, thin it out a bit with a little water or broth. Cooking times may vary based on your slow cooker performance. Curious to know where you bought the container filled with Ranch Dressing ingredients. I’ve never seen that. Thanks for the yummy recipe. I found the larger container of ranch mix at Costco, Lexy. You can also order online through Amazon if you don’t have a Costco nearby. We grew up with pork chops in mushroom soup gravy. I like the idea of doing it with cream of chicken and ranch. We’ll have to try this version! Pork chops with mushroom gravy are so good, too. It’s good to have options, right? Thanks for stopping by, Carlee! This looks wonderful! It’s our feature tonight at the Retro Re-Pin Party on Somebody’s Dinner. Lori, I hope to see you again tonight to see it. Thanks for the feature, Julie! I’ll be sure to stop by again tonight. This looks yummy! I can’t wait to try it out! Thanks for sharing on Tips and Tricks! This looks so good. Can’t wait to try this one!! Thank you so much for linking up at Tasty Tuesday! Your recipe has been pinned to the Tasty Tuesday Pinterest board! Please join us again this week! Love this recipe and cannot wait to try it out. My husband loves porkchops and I love any recipe that requires a crock pot! Perfect combo! Thanks for sharing on the Tips & Tricks Link Party. Thanks, Jeannine! I hope you enjoy it as much as we do. What a great recipe for a very busy day, it looks delicious and so easy! Thanks so much for sharing with Full Plate Thursday and have a great day! I make this also. Super easy and absolutely fabulous! Sometimes the simplest, easiest recipes are the BEST! I never know what to do with pork. This sounds delicious! Me, too, Andrea! I hope you give it a try.